Amanda Beech, Zach Blas, Rabih Mroué, Uriel Orlow and Ming Wong, Bala Starr, Bridget Crone. 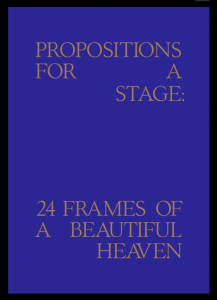 Published to accompany the group exhibition Propositions for a Stage: 24 Frames of a Beautiful Heaven. Amanda Beech, Zach Blas, Rabih Mroué, Uriel Orlow and Ming Wong. Texts on the artists and works in the exhibition by Bridget Crone.